Downtown Ithaca’s ribbon cuttings are free and open to the public and members of the press. Hare and Bristle offers a non-traditional salon setting featuring a creative and cozy vintage space with a rotating collection of rare art pieces. In this artsy space, salon owner Danielle Kearns, a multi-talented lead stylist and color correcting expert, provides her customers with unique and inspiring haircuts, indie and cutting-edge styles, and fabulous hair color. “I excited to show the public that Hare and Bristle can give them a haircut that surpasses current trends; cuts that are fun, stylish, and extremely manageable. We’ve already received so many wonderful compliments about our unique services, so I’m thrilled that I opened a salon here,” says Kearns, a New Jersey native. Hare and Bristle shares space with Petrune, an extremely popular men’s and women’s vintage clothing boutique at 126 E. State St., The Commons. The salon is located on the second floor of the shop and is open Monday, Tuesday, and Wednesday from 11 a.m. to 7 p.m.; and Thursdays and Fridays from 11 a.m. to 5 p.m. On Saturdays, it is open by appointment only. Call (607) 379-8080 or email HareandBristle@gmail.com to make an appointment. “We are delighted to welcome Hare and Bristle to downtown’s group of exceptional and highly skilled salon service providers. The partnership Hare and Bristle created with Petrune is sure to help both businesses enjoy excellent success,” says DIA Executive Director Gary Ferguson. Hare and Bristle’s and Petrune’s partnership joins a growing list of hair care and clothing collaborations in downtown Ithaca. Narrative Space, 213 N Aurora St., and Gia’s Elite Style, 121 S Cayuga St., also pair these services under one roof. Additional information about downtown Ithaca’s retailers and salons is available on the Downtown Ithaca website, http://www.downtownithaca.com. Also, on Thursday, check out the CFCU 2017 Summer Concert Series’ final performances: The Battle of the Bands competition and Jimkata’s Farewell Ithaca concert. The Battle of the Bands starts at 6 p.m. on the Bernie Milton Pavilion stage with hip-hop artist Knew, the winner Ithaca Qualifying MC Cypher contest, warming up the crowd with her profound rap lyrics before Stranded with a Kiss, Fall Creek Brass Band, and Kitestring duel for Battle of the Bands winner status. Immediately following the Battle of the Bands contest, Ithaca’s own beloved band Jimkata will perform its final show in Ithaca. Further details about Thursday night’s performances are available on Downtown Ithaca’s Facebook Events Page and at its website, http://www.downtownithaca.com. ITHACA JUNE 27, 2017 — Assisting the homeless and those who are in need is the daily struggle of many cities; however, Downtown Ithaca has developed a compassionate plan called Pay It Forward to help these individuals. Pay It Forward is a community outreach campaign that allows the public to make a donation that will assist those in need with purchasing a meal or sundries from participating businesses. The public may also donate by making a contribution in one of three red donation boxes. Three boxes are on the Commons. One is Aurora St., the second near Home Dairy Alley and the third in Bank Alley. All of the money collected from the donation boxes will be used to buy food and basic necessity items for Ithaca’s homeless and people in need. 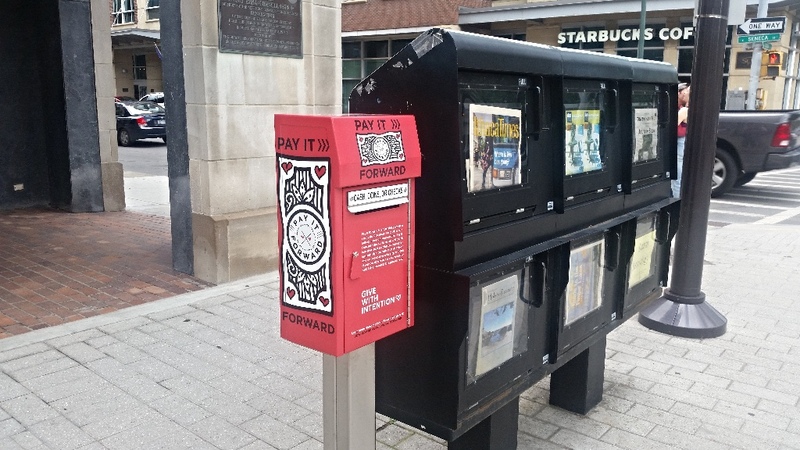 Pay It Forward donation boxes are located at three sites on The Ithaca Commons. Here’s the Bank Alley donation box. The program is managed by the Downtown Ithaca Alliance (DIA), a not-for-profit community development organization charged with creating and sustaining a vibrant and healthy city center. The DIA, City of Ithaca, Community Outreach Worker Tammy Baker, Center Cafe owner Terry Little, and Ithacash were instrumental in helping this program come to fuition. DIA Executive Gary Ferguson notes, Pay It Forward brings together interested merchants, the donating public, nonprofit providers, and the Community Outreach Worker Program. The DIA is working with the Community Outreach Worker Program operated by the local nonprofit Family and Children’s Services to educate those in need about the initiative. “Despite our inventory of nonprofits and support programs, we have not always been able to meet the basic needs of people on the street. Pay It Forward is a creative and engaging way to involve the community in addressing one of our most fundamental and basic issues — providing for people in need. It does not duplicate existing programs or services; it complements current services provided by nonprofits,” Ferguson said. The DIA encourages the public to consider supporting the Pay It Forward Program by placing a contribution in the donation boxes or paying directly to the participating businesses. The DIA is also working to enroll more businesses in the program. Currently, Center Cafe inside of Center Ithaca on The Commons, Green Street Pharmacy, and Casablanca Pizzeria are participating in the program. You may have noticed near Center Cafe’s food service window a white board covered with sticky notes dollar amounts on them; that’s Pay It Forward! How it works is giving citizens may pre-pay for a meal, or donate to the participating business without making a purchase, or they may place a donation in the Pay It Forward boxes. Any amount of money donated to this cause is greatly appreciated. Again, the program guarantees 100 percent of the money donated will provide the area’s homeless and people in need with meals and sundries such as batteries, toiletries, or a bus pass. “What I like about the program is that it can show people that even the smallest gesture such as purchasing an extra cup of coffee for someone in need can go a long way. I am also hoping to show other businesses that it doesn’t take a lot of work or even too much planning to help those in need. If you set up a way for people to help others they will,” said The Center Cafe Owner Terry Little. A person in need may participate in this program simply by going to one of the participating downtown businesses and pulling from a bulletin a note tag that is redeemable for food and other necessities. For the creation of this outstanding community outreach program, The City of Ithaca was the recent recipient of a CommunityWins Outstanding Achievement Grant awarded by the U.S. Conference of Mayors and Wells Fargo. Ithaca was one of six cities to win the grant; 245 cities applied. The grant funds will be used to augment the program by providing a pool of funds for replenishing Pay It Forward meals and items at the participating businesses and by paying for program marketing materials aimed at Downtown workers and visitors. The DIA thanks the City of Ithaca and Downtown Ithaca businesses for participating in and supporting the Pay It Forward Program. For more information about the Pay It Forward Program, contact the DIA at (607) 277-8679 or email info@downtownithaca.com.